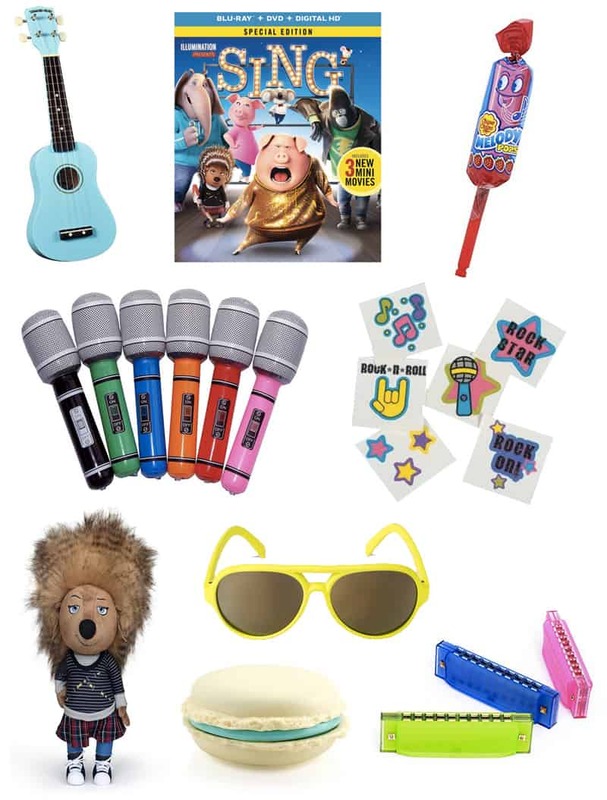 Do your kiddos love to take the stage as much as the characters from SING? 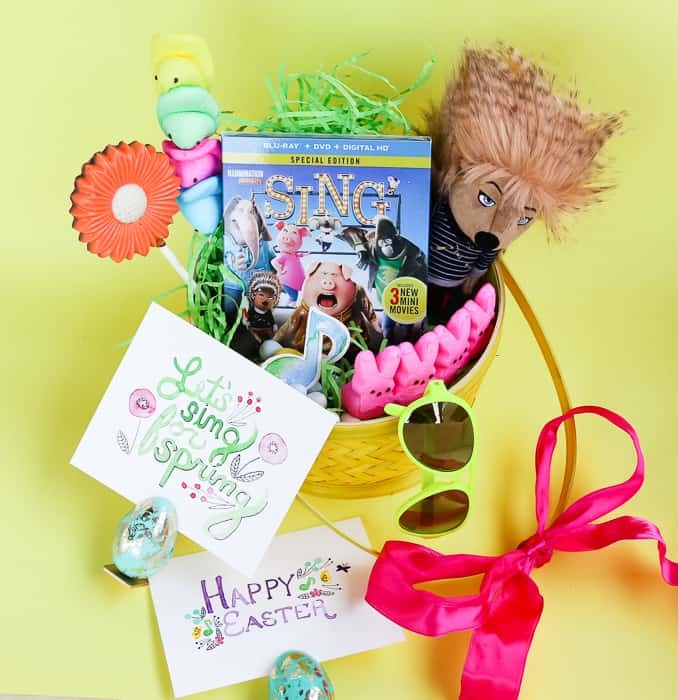 In partnership with Universal Pictures Home Entertainment, we’ve put together a basket of goodies sure to inspire the Easter bunny to bring your singing cuties a few fun surprises for their next gig. 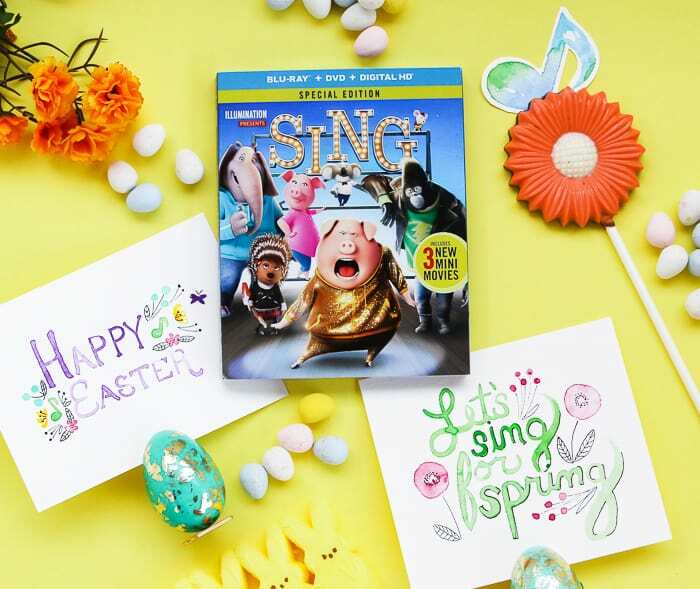 We are so excited that the Special Edition SING Blu-Ray + DVD is now in stores that we also created a page of watercolor printables that are perfect for gift tags, greeting cards or even framed as artwork. 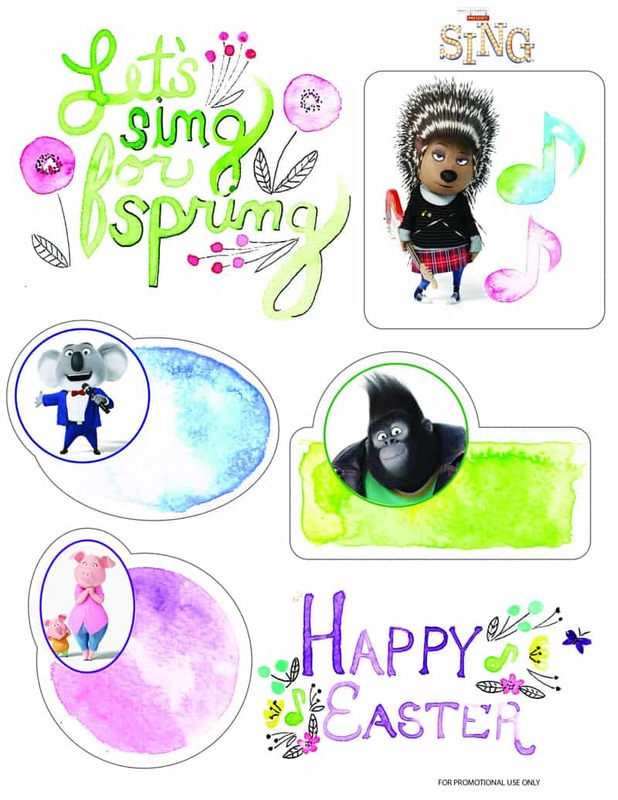 Read on for the SING inspired Easter basket and free printable. When Buster Moon, a romantic dreamer of a koala played by Matthew McConaughey, schemes to save his theater with a singing contest, hilarity and heartbreak and high-notes ensue. I loved all of the characters in SING, from punk rock porcupine Ash, voiced by Scarlett Johansson, to Rosita, an overworked mom of 25 piglets who dreams of stardom, played by Reese Witherspoon. The kids and I found ourselves rooting for this band of animal misfits and singing right along. I think we could all relate to the characters’ desire to belt out a tune, even if it’s just from the comfort of our own living room (or shower.) 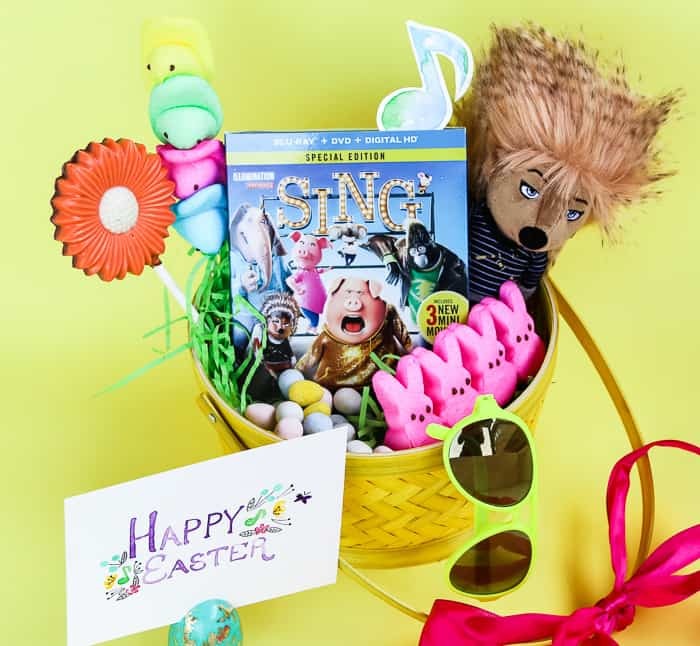 It inspired me to pull together the perfect Easter basket inspired by SING. Ukulele – This Ukulele comes in a rainbow of colors and is a fun addition to your collection of toy instruments. 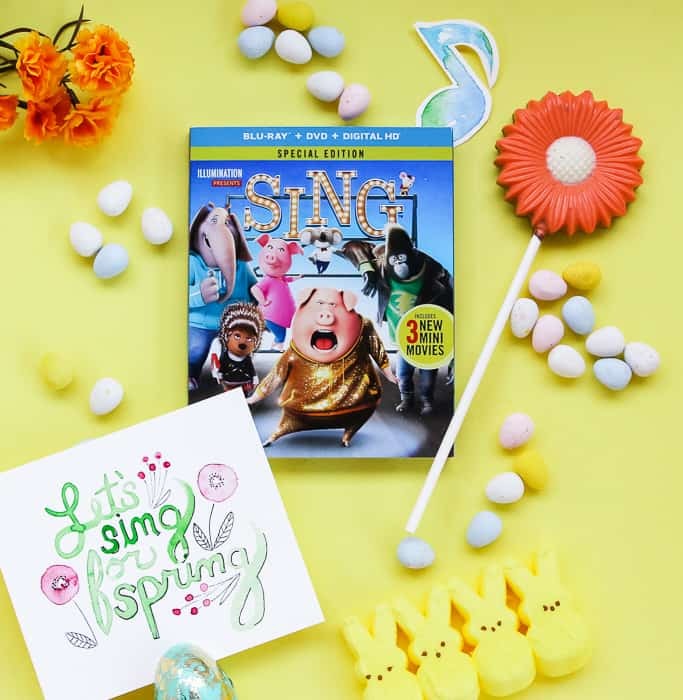 Sing Special Edition Blu-Ray + DVD – In addition to the feature, this special edition includes 3 hilarious Mini Movies featuring the characters from the film. Yes, Gunter! Melody Pops – OMG, yes! Do you remember these? They would have to be in any Easter basket inspired by music. Microphone – At about $1 each, these microphones might be the perfect way for me to get my pepper mill back from my son. Rock Star Glitter Tattoos – Tattoos are the perfect egg stuffer! No melting! Is that only a Texas problem? Candy melting in the eggs? Anyway, rock on dude! Ash Plush – Ash is so cute. I may have decided that I “needed” a plush of her for my Easter basket photoshoot. Neon Aviator Sunglasses – Clare has claimed these as a necessity for her upcoming 4th grade field day. If Clare likes them, they are cool. Just trust me. Macaron ear buds – Um, an extra set of these Macaron ear buds are going to drop into the cart “by mistake.” They are too cute. Harmonica – And lastly, buy every kid in the neighborhood a harmonica. What could go wrong? You have ear buds! wink! Click here to download the FREE printable that we created inspired by SING. Such a fantastic giveaway! My daughter loves sing so much we watched it twice at the movie theatre! Might have to enter this giveaway … such great prizes!